The screenshot above is hosted and provided by easefilter.com. Please contact them directly for any copyright infringement as we are not responsible for that content. Last Update: 2018-09-08 - New Release: Added File system encryption filter driver SDK. EaseFilter File system encryption filter driver SDK provides a comprehensive solution for transparent file level encryption. It allows developers to create transparent encryption products which it can encrypt or decrypt files on-the-fly, it can allow only authorized users or processes can access the encrypted files. Supported strong cryptographic algorithm Rijndael is a high security algorithm which was chosen by the National Institute of Standards and Technology (NIST) as the new Advanced Encryption Standard (AES), it can support key length 128-bits, 192-bits and 256-bits. 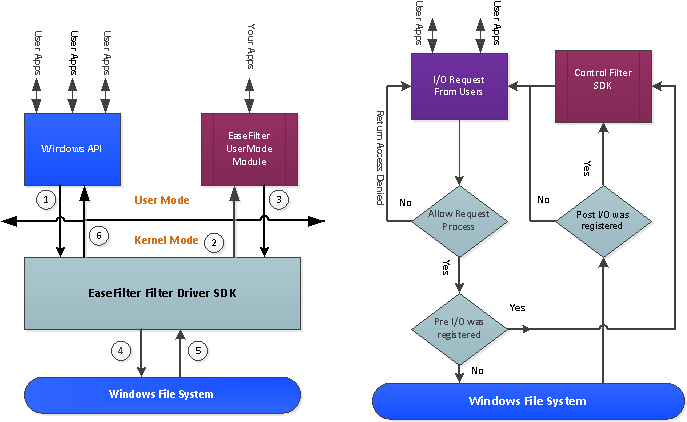 EaseFilter File System Mini Filter Driver SDK is a mature commercial product. It provides a complete modular framework to the developers even without driver development experience to build the filter driver within a day. The SDK includes the modules from code design to the product installation, it includes all the basic features you need to build a filter driver.